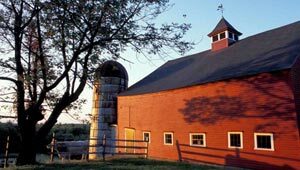 In Bolton, Massachusetts, west of Boston, the farms owned by the Schartner and Nicewicz families have been cultivated since colonial times. But across New England, towns are losing farms to development. Bolton residents and the local land trust sought to preserve two adjoining farms that had supplied the community and region for generations with pumpkins, corn, hay, flowers, peaches, plums, blueberries, and 20 varieties of apples. In 2004, working in partnership with the Bolton Conservation Trust, the town of Bolton, and the state, The Trust for Public Land negotiated agreements to purchase Agricultural Preservation Restrictions (APRs) over both properties and then helped to raise nearly $4 million to purchase the APRs. The restrictions permanently protect the land from development, while allowing agricultural use to continue.